All the Jewelry, Purses, Scarves, & Katie Daisies are all one of a kind and all handmade by Katelynn Dole. Every scrap of fabric is used to make extras like the Katie Daisies and the flowers on the purses. All beads are bought for a purpose of certain projects I am working on. Every piece takes a while to make because a lot of thought and trials take place. If something does not look right it is taken apart and redone until the look if the way it is suppose to be. All Jewelry is handmade & beads are all handpicked. All the jewelry is one of a kind. Some necklaces have matching earring. In the description of the necklace or earrings it will tell you if it has a match. Bottle Cap necklaces are all one of a kind. Scrapbook paper and bottle caps were use to make them. 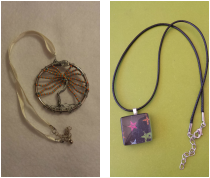 The Tree of Life Necklaces are all hand wired and hand beaded. All Purses and hair clips are one of a kind and handmade. After the purses are made the extra fabric is used to make the Katie Daisies. That way the left offer fabric does not go to waist. The flowers on the purse is also made with extra fabric so give the purses decoration.